At ToyConUK last month saw the soft release of Jaspar, the new blindbox platform by Gary Ham x Martian Toys. Jaspar being the platform that won the Martian Toys Blank Competition in the summer of 2017. Two years later and we have the official release of Jaspar today!! Yaaaay! With artists involved – Gary Ham, JellyKoe, Mizna Wada, Muxxi, Dex Dexign, Yema Yema and Dok A – we have an awesome lineup of artists that have brought it with this new platform. 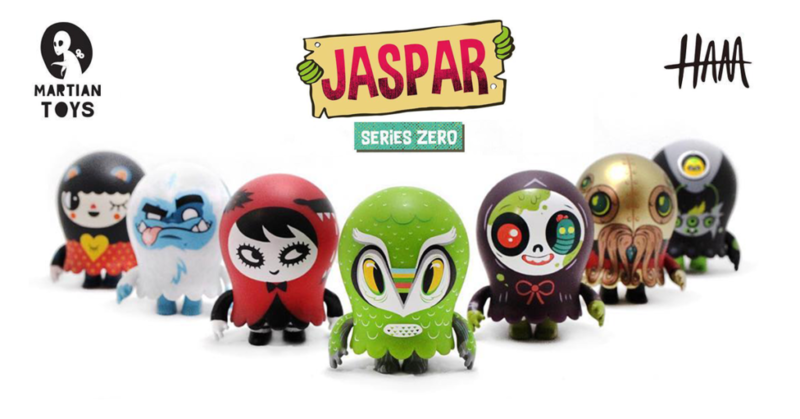 There are seven designs of Jaspar available with ONE chase in Series Zero. Available today from martiantoys.com and strangecattoys.com, you can purchase the blind box for $13 (about £10). However, you can purchase the full set of seven for $100 (about £76). As we mentioned there is a chase of the Blue Hootler (picture below hiding in the background) for $120 (about £92) which are only available from Martian Toys. Jasper is 2inches tall, and as you can see below the size difference of Jaspar against their peers – the Kidrobot Dunny and Superplastic Janky. A wonderful size, if you ask us. We have fallen in love with Jaspar and can’t wait to see more in the future. Viva la Jaspar!